A review and paper on the Michael Crichton film, The 13th Warrior. This movie recounts the events that led to the Anglo Saxon/Old English epic poem Beowulf as if witnessed and chronicled by an Arab man of letters, Ahmed ibn Fahdlan (Banderas). This is a beautiful and well-executed film if gory in the way one might expect of such a portrayal. Lo, there do I see my mother and sisters and my brothers. In the halls of Valhalla where the brave may live forever. 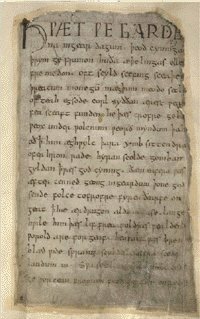 Beowulf is an Old English epic of almost thirty-two hundred lines in alliterative verse. It is the earliest extant composition of such length in English and indeed in all Teutonic literature. Its content was based on Norse legends, merged with historical events of the early sixth century in Denmark; this oral tradition was carried to England by Danish invaders of the mid-6th century, fused with the Christianity they absorbed there, and finally written down by a single, but unknown poet circa 700. 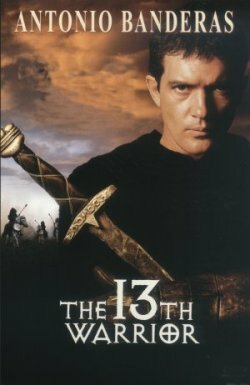 The 13th Warrior is a ninety-minute gory movie about Vikings running about beheading and dismembering each other and their foes. Or is it? This paper presents Beowulf for the enjoyment of the viewer of The 13th Warrior and discusses similarities and differences between the two works. For those interested in seeing this film, it is rated R for violence and gore (there is plenty of it). However, the film contains no rough language or scenes of any sexual nature. Incidentally, Richard Wagner used this poetic device in his opera cycle Der Ring des Nibelungen (The Ring of the Nibelung, often referred to as the Ring Cycle of four operas). It imparts a sure, otherworldly or ancient feeling suitable to these operas on heroic, mythological themes which is what Beowulf is. In the brief summary of the poem which follows later, I have attempted to run in parallel the story from the recent film, The 13th Warrior based on Michael Crichton’s book Eaters of the Dead (also recently republished under the same title as the movie). The notes in the second column point out the common and different points between the ancient poem and Crichton’s story. Crichton explains in his book that it is the result of accepting the challenge by an acquaintance to rewrite the epic through the eyes of a chronicleras if a historian had witnessed the same event and written it more as would a journalist of the period. The chronicler as a literary phenomenon was an interesting deviation from the mostly oral transmission of records prevalent in all cultures. Most legends, like the war over Helen of Troy, were told or sung by poets and minstrels for ages before being written down, by which time a great deal of embellishment had been added as well as the choice and refinement of the heros of the particular epic regardless of whether they existed or not. Instead, a chronicler wrote down events much as a journalist would today (avoiding the question of accuracy in journalism since that is not the subject of this essay). They are in fact the founding fathers of journalism. Probably the most famous chronicler in ancient history was Xenophon who accompanied Cyrus’ ill-fated expedition to unseat the latter’s brother, Artaxerxes the Second of Persia. Cyrus lost his life and Xenophon himself ended up taking revenge upon the Persians and leading the army, composed mostly of Greek mercenaries, back home. He then composed the Anabasis (or March up [the] Country), an historical account of the expedition and his life as a Greek soldier that has endured through the ages. Here then, is the comparison of Beowulf and the 13th Warrior. The story of Beowulf’s exploits begins in Scandinavia. The 13th Warrior first sets up the chronicler’s journey, starting out in Arabia. A young, lettered nobleman of Baghdad, Ahmed ibn Fahdlan ibn Alabas ibn Rachid ibn Hamad, who serves the great Calif, is sent as ambassador to a country in the Caucuses as punishment for his interest in a beautiful woman belonging to the harem of the Calif’s friend. During the voyage, a series of mishaps place him in the company of Norsemen. A messenger from the Scandinavian kingdom, ruled by Hrothgar, comes bearing news that the land has been laid waste by an ineffable horror and bids the Viking chieftain, Buliwyf, son of Hygelac, come to save them. An oracle insists that the company of braves must number thirteen. Ibn Fahdlan is unwillingly enrolled as the thirteenth warrior. The journey to the north countries amazes and bewilders the Arab by its savagery and hardship. During the voyage, he learns Norse. Hrothgar, king of the Danes on the island of Zealand has built a great hall for feasting his warriors, but they abandon it because of the murderous ravages of the monster Grendel, a giant in human shape and a descendant of Cain who lives in a murky pond with his mother among other strange and vicious sea beasts. The village and surrounding areas ruled by Hrothgar have been laid mostly waste by a force which none dare name out loud, the Wendol, a collective plural referring to a numerous host of savage warriors whom the people think are like bears. That they are not named means the people hold the belief that they are unspeakably powerful and evil. For twelve years, mother and son come to land occasionally and devour human victims. Hrothgar hasn’t heard from any outlying villages in months. Few warriors or village people remain after the ravages. Beowulf, son of Ecgtheow and nephew to King Hygelac of the Geats, a tribe on the southern shore of Sweden, arrives with fourteen warriors to challenge the monster and is received by Hrothgar at a feast. The warriors, led by Buliwyf and accompanied by ibn Fahdlan, arrive in the kingdom and are feasted in a great hall. A prince of the Royal Danish family, Unferth, son of Ecglaf picks a quarrel with Beowulf. He is jealous that a Geat prince has come to save the Danes. Beowulf tells him that if he had any valor, he would not have had to come and deliver the Danes from the monster. Wigliff, the son of Hrothgar, fears the company of warriors will take the kingdom for their own if they defeat the Wendol. To put Wigliff on his guard, a thane of Buliwyf picks a fight with one of Wigliff’s loyals. Diminutive in stature, he allows himself to be sorely abused and appears half dead until the bigger man lunges for the death blow but loses his head to the smaller yet older and wiser warrior. The Geats spend the night in the mead hall; Grendel arrives in the dark. Beowulf has heard that the monster is impervious to weapons and plans to go at Grendel with his bare hands. In a mighty fight, Beowulf wrenches the monster’s arm from its shoulder dealing the monster a mortal wound. The company of warriors sleeps in the hall that night after the feast at which they take no beverage. (This point is noted by ibn Fahdlan who is Muslim.) The Wendol come in the night and break into the hall where a mighty battle ensues in which each man is certain to have slain at least two of the enemy. Many are wounded and one of the defending company is killed. Ibn Fahdlan fights cumbersomely in the first night battle in the hall, but succeeds in slaying one monster. The next day, he fashions a more maneuverable and graceful scimitar from a Norseman’s long sword. Grendel flees the hall. The next day, Grendel’s arm is mounted as a trophy. Hrothgar gives a triumphant feast in the hall, but as they sleep off the drink, Grendel’s mother comes to avenge her son, slaying a Dane and stealing the severed arm. In the morning, other than a manufactured claw made from the paw of a bear, they discover little sign of the Wendol, who apparently never leave their dead on the field of battle. The company goes to work to build up the center-hold’s defenses including the great hall. The Wendol come later when the land begins to mist up and a new battle begins. Ibn Fahdlan discovers the awful truth: that the Wendol are human-like. But again, little proof of what they are remains behind. Beowulf plunges into the demon-infested pond where the monsters live and wrestles with Grendel’s mother. The sword named Hrunting, which he carries proves to be of no use, but he finds a sword crafted by the giants and beheads her. Then he severs the head of Grendel, who has died there of his wound, to bring back as a trophy. Accompanied by his surviving companions, the chief warrior strikes out to find the marauders. He encounters an oracle or witch who reveals to him where he will find their home. They company will discover that the Wendol live in a cave near an underground river. The chief leads them into the caves revealed by the witch where he kills the mother of the Wendol by beheading her. He doesn’t find the Wendol leader whom the witch warned him to kill. They must escape the alerted Wendol by swimming in an underground channel that lets out into the sea through a cliff. Hygelac, Beowulf’s uncle, and his son both die in subsequent wars (the epic suffers from a severe anticlimax after the defeat of Grendel as it lapses into a record of Beowulf’s reign) and Beowulf becomes king of the Geats. He later dies fighting and overcoming an attacking fire-breathing dragon, angered by the theft of a golden goblet from his hoarded treasure, his warriors all having abandoned him but one. The surviving warrior berates his comrades for their cowardice and Beowulf is given a state funeral. Crichton’s Buliwyf dies after the ultimate battle brought on by the beheading of the mother in the caves at which time he receives a mortal wound himnself. It is the life of the Wendol mother that was stolen and, as he didn’t kill the Wendol’s leader (the counterpart of Grendel in Beowulf), the Wendol attack again. Though mortally wounded, the hero finally defeats the Wendol leader and dies sitting stately among the pickets as if enthroned. Note that the second battle, in which the Wendol came with fire in a line as if a great dragon, has not been described. It corresponds to Beowulf’s ultimate defeat later after becoming king of the Geats. In the etiological section of his novel, Crichton evokes an argument of fantasy in which Neanderthal man survived, not merely until about 8000 years ago, but well into the first millennium after Jesus or about the time of these events. The Wendol would be the final Neanderthals in the struggle against Homo sapiens and they receded to extinction shortly thereafter, having been pushed further and further north in search of land and a living. The movie made of the novel was reasonably faithful in its portrayal generally following the sequence of events and battles described by the book’s author. Despite Crichton’s involvement, some inaccuracies crept in like the chronicler’s need for a Greek and Latin interpreter, Melchisadek, though ibn Fahdlan knew both languages in the book’s account. He communicated with one of the Norseman who knew some Latin until his Norse became strong enough. Certainly, the scene in the movie in which he revealed his understanding of Norse was more dramatic than in the book. In real life, however, it might have got him killed, unhappy as the Norsemen might have been to find out after speaking in front of him that he had learned their tongue. Crichton’s novel accomplishes an excellent approximation of the chronicle of a series of events about which songs would be sung and rhymes chanted. This presumably would be the model of a distant, literary basis for the Illiad, the Odyssey and the Aeneid. Every student of Classics has wondered early in his or her studies what really happened at Troy, how much is true, did Helen exist? Was there an Aeneas that fled from Troy and contributed to the establishment of a great power, Rome, that would ultimately dominate Greece a millennium later? Crichton’s imagination sketches for us what a journalist might have made of the events on which the English epic, Beowulf, was based. Michael Wood’s In Search of the Trojan War left us wondering about the identity, the ethnicity, the economy and the true story of Pergamum. Crichton casts before our eyes the dramatic account of the salvation of Scandinavia and the end of a fearsome race of people. Beowulf, translated by R. K. Gordon in 1926, 1992, Dover Publications, Inc.
Benét’s Reader’s Encyclopedia, 1987, Harper & Row, Publishers, Inc., New York. The American Heritage Dictionary of the English Language, 1992, Houghton Mifflin Company. Petit Larousse illustré, 1983, Librarie Larousse, Paris. Xenophon, Anabasis, 1962, University of Oklahoma Press. Crichton, Michael, Eaters of the Dead, 1974, (I lost the book). Wood, Michael. In Search of the Trojan War, 1985, British Broadcasting Corporation, London.